Our bedroom has become the official "bed" room. For the past 4 years our King sized bed has been the family bed for all of us. So, we bought another bed to go next to the King. Now we have a King, a Twin, and a toddler bed, all squeezed into one room. I walked in after we were all done rearranging, and it seriously made me smile and feel so happy! We've never liked the idea of being separated from our babies. We've never used a crib, and have always loved the the warmth, the scent, the safety, and the ease of nursing, with babies sleeping in our bed. And then as the babies grew older, it only seemed natural that they should keep cuddling with us at night. The other night Zadok put his little arms around me at around 3am and whispered "I love you so much, Mama." It made my heart melt. I know my kids need us at night...and we need them. This new arrangement is wonderful! I was thinking how grateful I am for people in my life who do what's right for them, and what they want, without thought or care of what others think. Strong, confident, moral individuals, who think for themselves. My grandmother is a lot this way, and I truly look up to her for her courage to be different, in a mainstream, judgmental world. She always marched to the beat of her own drum, and never cared if anyone followed. She took ownership of her life and lived it to her fullest....Her religion was her own, her family was her own, her hobbies and interest were her own, and her life was her own, however she wanted to make it. She is 99 now, and ready to leave this crazy Earth, but she'll always be a role model for me. This is something I strive for in my life, not just as a Mother, but as a person. 99! Wow. This photo is priceless. You make me want my Leila (grandmother) right now. Love your cute hats by the way. Did you make them? and are they easy to make? 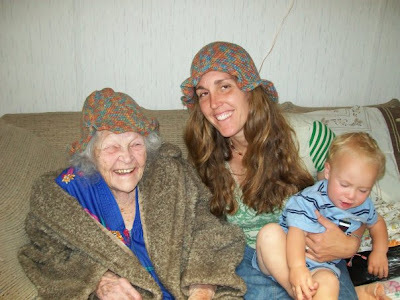 Nita-- My husband is the hat maker in the family. I don't crotchet. He also makes scarves, purses, little bags, etc, etc... I wish I knew how! I remember your grandma she has such a cute smile. Didn't she have a slide on her porch?